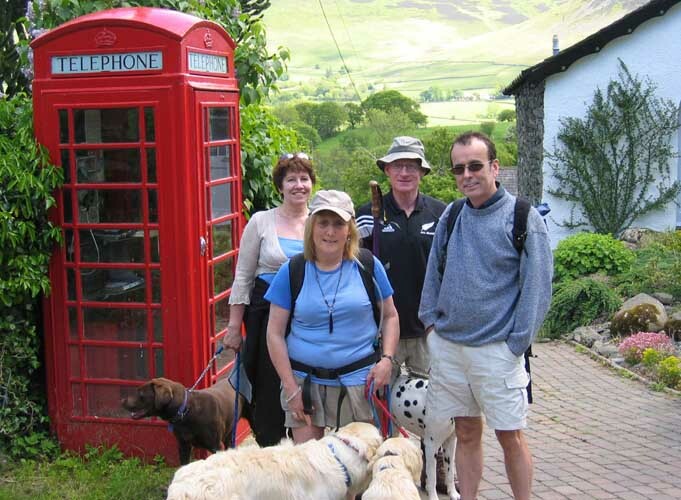 Occasion : A walk with Pat and Robert, Hilton and his dogs, Ann and myself and not forgetting our dogs too. 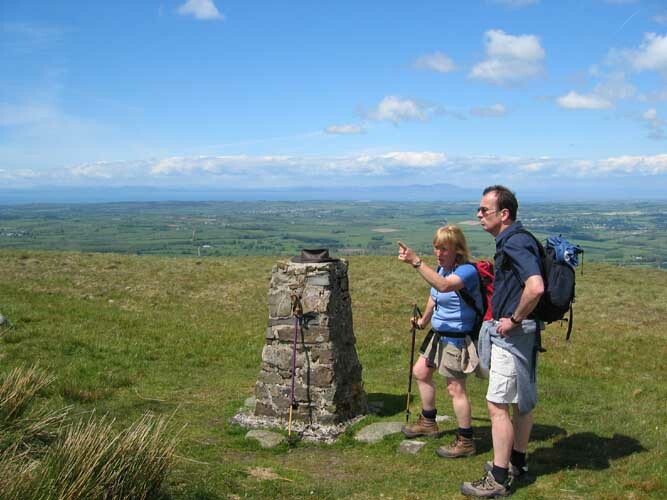 Walk details : A linear walk of 4 miles and 1400 ft of ascent. a leisurely three hours. Good visibility. Weather : Beautifully sunny, a slight breeze. The starting point was Thackthwaite on the back road of Lorton Valley. From the village we made our way up the track towards the northern end of Low Fell. Many of the trees damaged in the gales are now cleared or stacked as firewood, but many are still lying on their side where they fell. Where the root system was only partially broken they have sprung into leaf with the new season and will no doubt survive but with much deformed profiles. Branching right of the track leading to Watching Crag, we climbed the bracken and grass slopes of Fellbarrow. From the top the views were magnificent in the superb sunshine and excellent visibility. 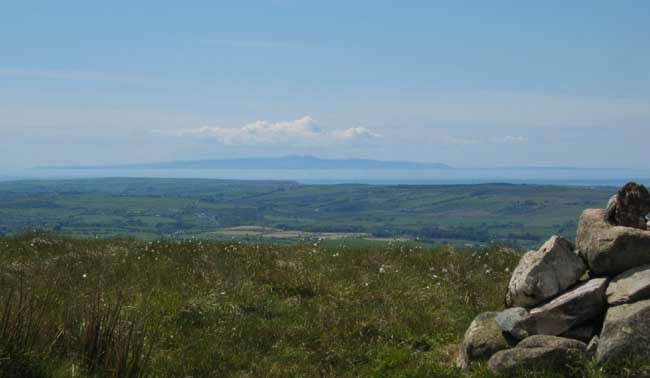 Behind Ann and Robert are the Scottish Hills and in the middle distance the town on Cockermouth, home to Jennings Ales and the scriptwriter who penned such jems as " It never rains but it pours" (picture of beer tap and glass) and "Up hill, down Ale"
Back to that visibility thing - the Isle of Man looking as clear and detailed as we have ever seen it. The top of Snaefell is in fact 50 miles away, today it looked more like half that. 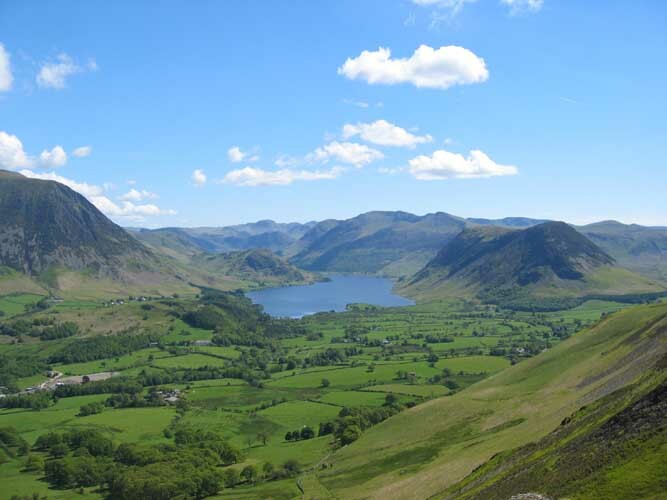 Casting our eyes south rather than west, this is the classic Crummock Water, Buttermere Valley view. To the left, Grasmoor, centre is Gable summit and High Stile/Red Pike, with Melbreak the darker coloured peak to the right. 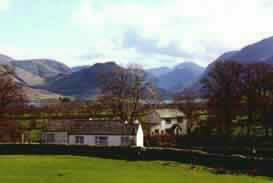 Scafell Pike, which we had seen earlier, is now hidden behind the High Stile Ridge. 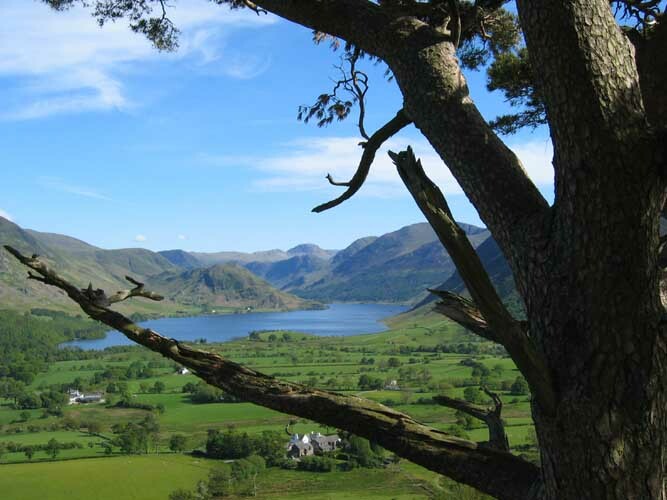 In reaching the end of the Low Fell ridge we could look down on our third local lake - Loweswater. Behind are the Loweswater Fells of Gavel, Carling Knott with Blake behind, and Burnbank. 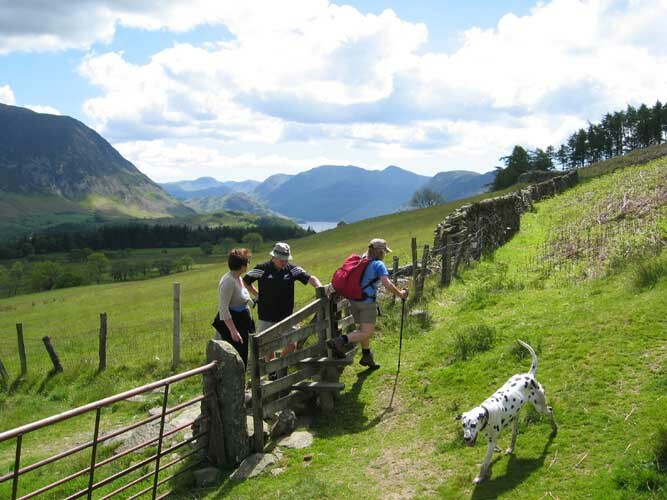 The start of a steep descent off the end of Low Fell towards home. 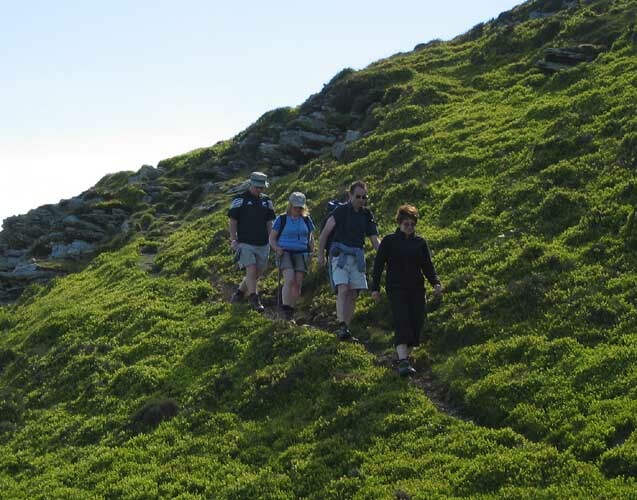 The rich greens of summer staring to show even here on the higher slopes. 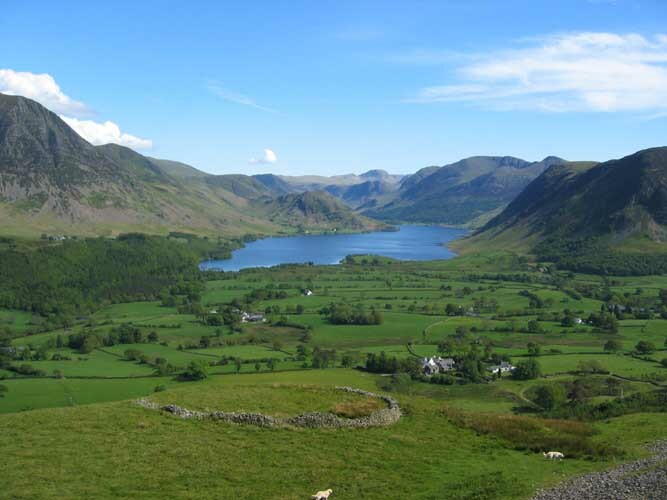 Part way down and the classic Buttermere Valley, but this time with a circular sheep fold on a slight bluff sticking out from the side of the hill. Superb views up and down the valleys here, so could this be the defensive site of some ancient dwelling or hut circle enclosure. The centre is quite rough, indicating fallen walls or the like, not quite right for a simple sheep fold. would probably be too young to know the true secret of the circular stones. A more modern sheep enclosure and one of the local farmers having a slightly less leisurely day than ourselves. 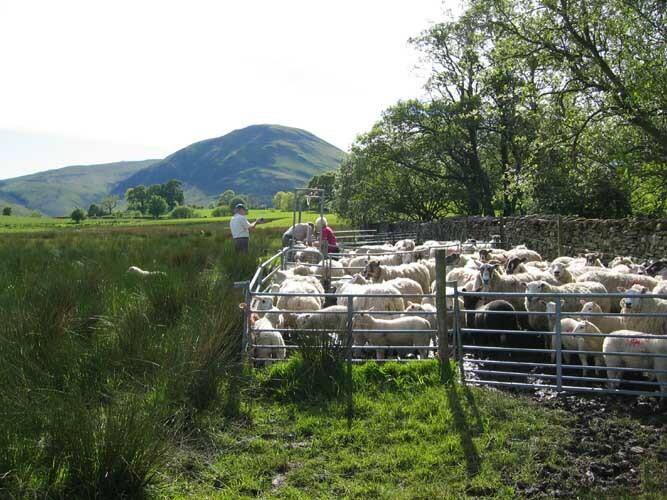 Here they have penned the older sheep and the sizeable new lambs prior to checking them out. 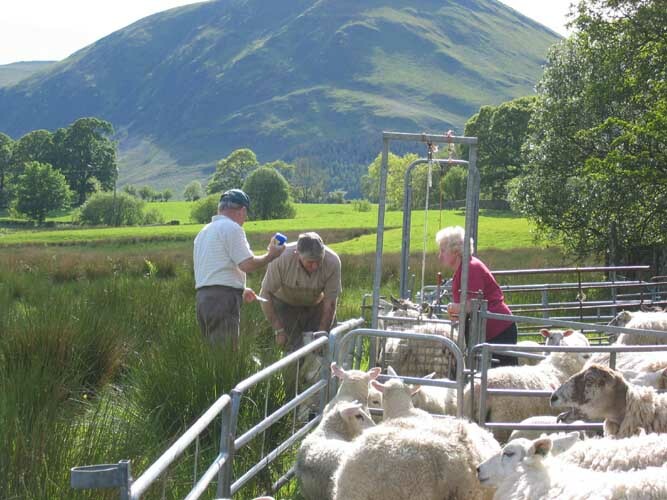 Johnny and Edna, plus Michael, give the new season lambs a worming injection. 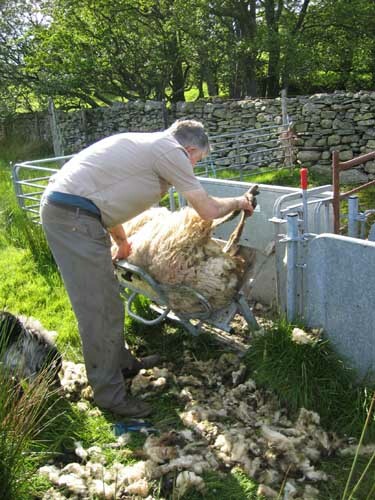 whilst the older sheep are given a slight trim of excess wool to help them stay cleaner and free of flies, and the subsequent danger from worms (fly larvae) laid on the dirty fleece . . . Out in the field the sheering scissors is still preferred to rigging up electric clippers for smaller jobs like this. And you just thought " sheep just grow in fields "
There's certainly a lot more to raising sheep than first appears. This site best viewed . . . with fell boots or muddy wellies depending on "play" or "work".